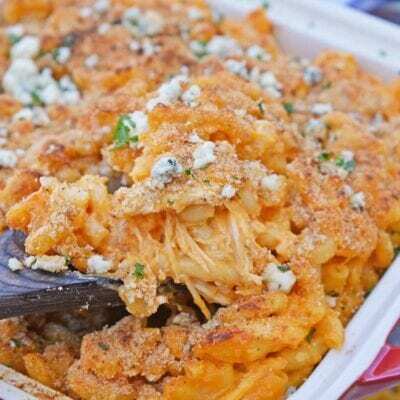 Move over sweet potato casserole, there’s a new casserole in town! 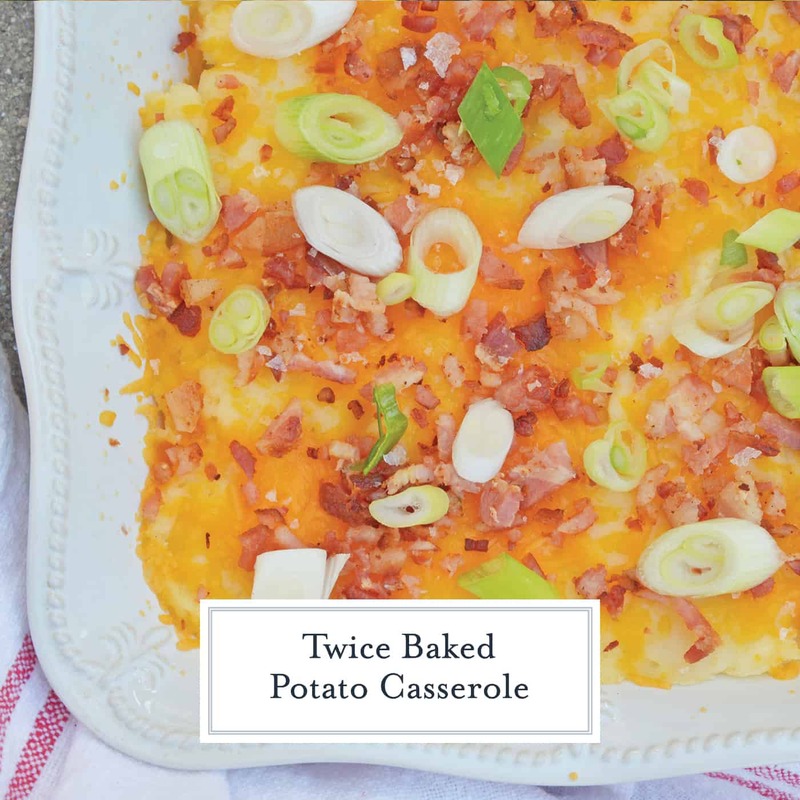 This easy Twice Baked Potato Casserole recipe will be your new go-to side dish! 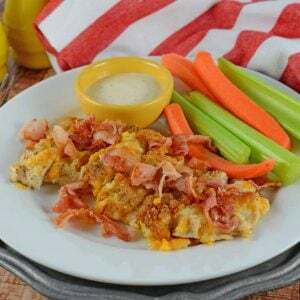 Loaded with bacon, cheddar cheese and sour cream, you just can’t go wrong! 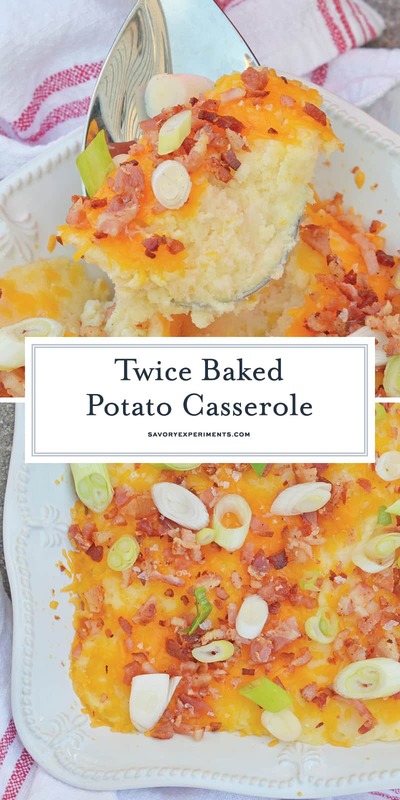 This easy Twice Baked Potato Casserole recipe is everything you love about twice baked potatoes wrapped up into one delicious casserole! 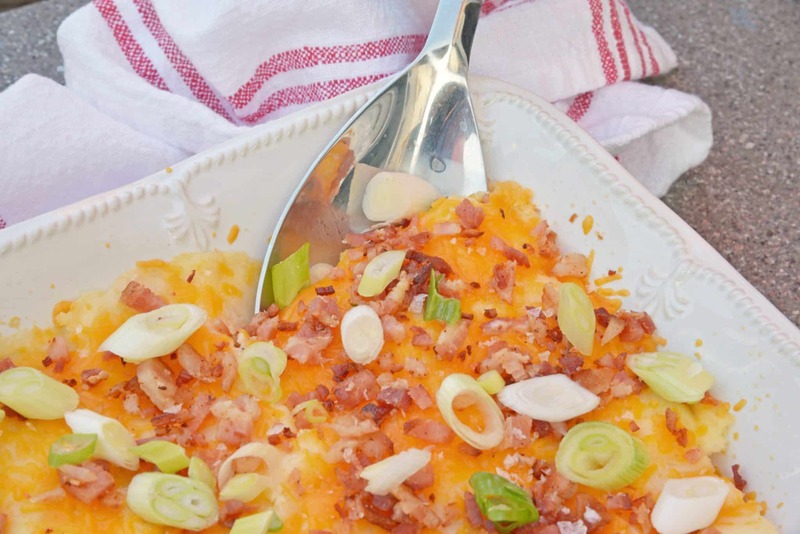 It is loaded with cheese and then topped with bacon for the perfect potato side dish. Let’s talk potatoes for a minute. I can honestly say that potatoes are one of my favorite foods – they are just so versatile! I mean, with all of the ways to prepare them, they should really just be their own food group, right? From mashed to fried to baked, there is a potato option for everyone! 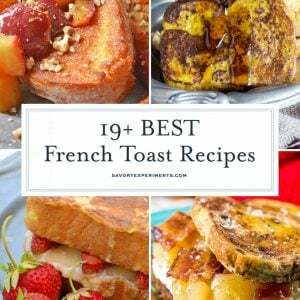 And don’t even get me started on the sweet potato recipes! When I was young, my grandpa was always in charge of making potatoes for the holidays. If he was making mashed potatoes, he’d always be sure to save me a beater to lick when he was finished – I thought that was such a treat! To this day, I think of him when making or eating potatoes; isn’t it funny how food can provoke such strong memories? Ever since those beater-licking days, my love for potatoes has only grown. 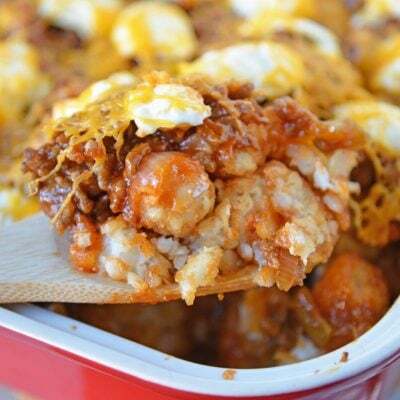 I like them mashed, baked, fried, and even made into a casserole like this Twice Baked Potato Casserole. It is the best, and it’s one of my favorite ways to prepare potatoes. 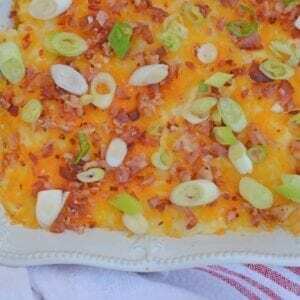 It’s loaded with all of your favorite potato toppings like bacon, cheddar cheese and scallions, and then made super creamy with the sour cream, milk and butter. There’s just no beating it! This casserole is a great way to use up leftover mashed potatoes, too. 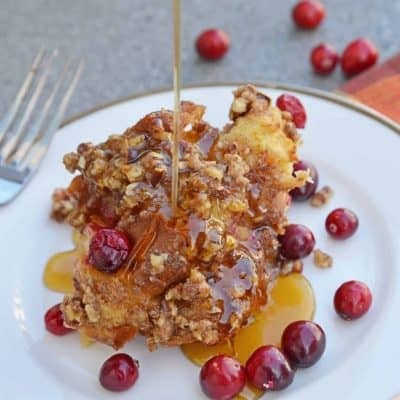 In fact, my favorite time to make it is after the holidays when I’m sure to have lots of leftovers. Since I took the time to make mashed potatoes, why not turn the leftovers into a delicious casserole? So if you are a potato lover like me and you are looking for an easy recipe for twice baked potato casserole, look no further! 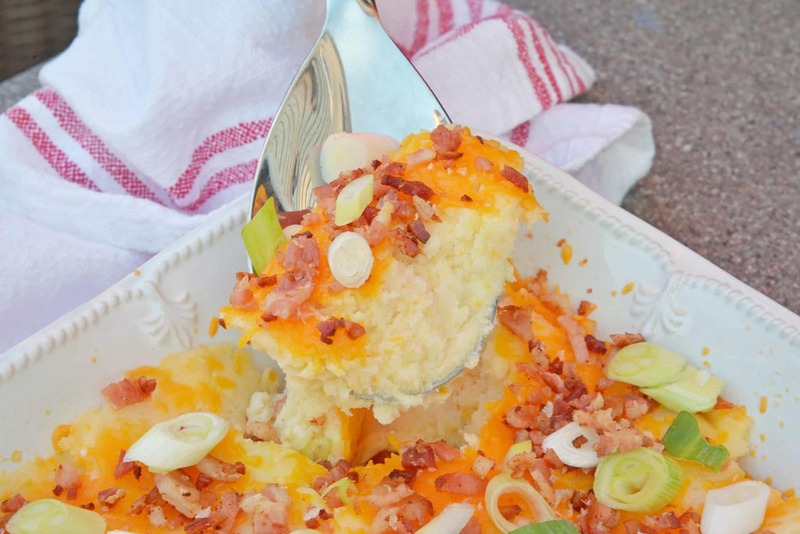 All of the best parts of twice baked potatoes are simplified into this delicious casserole. 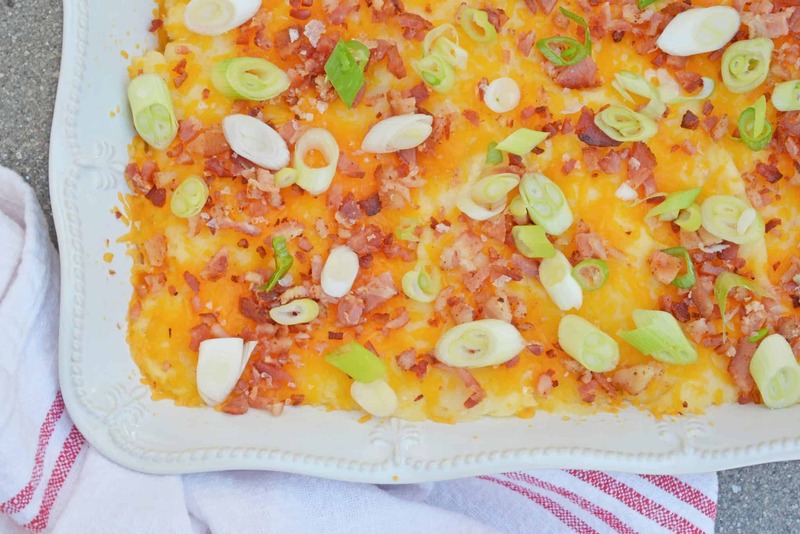 You will love how simple it is to make this easy Twice Baked Potato Casserole! Everything you love about twice baked potatoes is wrapped up into one easy dish. Preheat oven to 350 degrees. Coat a casserole dish with cooking spray. In a large mixing bowl, combine mashed potatoes, 3/4 cup cheddar cheese, sour cream, milk, butter, fine sea salt, ground black pepper and garlic powder. Stir well and pour into prepared casserole dish. 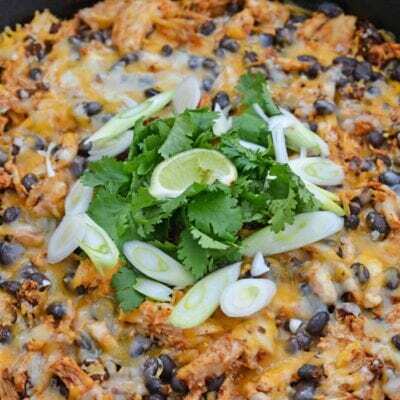 Top with remaining 3/4 cup shredded cheddar cheese. Remove and top with bacon crumbles and scallions. Serve immediately.